It is raining today. Like the night before a special birthday party or holiday, I could not wait for today to arrive. We’ve been working our landscaping pretty well here at the house, but the atmosphere hasn’t joined in as much. Today it is. Today is forecast to be a long rain. And, I want to talk about drought. I want to talk about drought not because the word “drought” represents 1/3rd of my vocabulary (the other 2/3rds being “tree”, “cool”, and “LesClaypool”), but because Summer 2016 represents the 50th Anniversary of the last year of one of the most significant droughts in the Northeastern U.S. State and federal agencies have been making measurements of temperature and precipitation going back to ca 1894/5 or the 1920s (though in some cases, decent records, though often with gaps, exist back to the 1820s or 1830s; one or two go back to the late 1700s) and the 1960s drought sticks out like a thumb that was struck by a 30 pound hammer while it rested upon a 5 inch thick slab of granite. It has been 50 years since parts of the Northeastern U.S. has experienced a significant drought. Ask the Trees, and they’ll suggest it has been at least two centuries, if not nearly three centuries, since the central and western New England, NY State, and northeastern Mid Atlantic region experienced a drought as severe. In exploring the U.S. Census a few years ago, it seemed to me that most of us Northeasterners were not alive at that time. What do we know about drought? This summer, we might be on the precipice of learning more. In no way would I try to predict the future, especially if trying to forecast future precipitation. The Northeast has generally been in unusually wet conditions, so-called pluvial conditions. Paleoclimatic records – those from tree-rings or lakes – indicate that much of the last 49 years are unusual compared to similar time frames going back nearly 500 years, if not 2000-3000 years. What goes up, must come down. Must, in scientific terms = most likely sometime in the near future; perhaps not. In looking over the prehistoric period, we are living in an era that is unusually absent of severe droughts or extended droughts, droughts that last 4-7 years. If whatever drives those droughts – and we are not completely sure of the drivers of precipitation in this region – returns, we might expect/should expect, an extended or severe drought. 2016 is continuing this pattern. It is raining today and it is expected that we might receive 1/3-2/3rds of the monthly average. That might not be enough to correct the current drought situation unless rain continues slightly above average through the summer. According to the U.S. Drought Monitor, much of the Northeast is “Abnormally Dry” or experiencing a “Moderate Drought”. I’ve been tracking this drought mostly through our garden. A bit unexpectedly, Maynard, Massachusetts, declared a “Level 1 Water Use Restriction” on May 18. Basically, this is non-essential water use is restricted between 9 am to 5 pm until October. That is striking, but it makes sense. As defined by hydrologists, October is the beginning of the water year. It is also roughly the time of year when trees stop requiring significant amounts of water to live and for growth. Thus, when they “relax” at the end of the growing season, our water tables can start to rise. [But, how will the water year change if climate change significantly extends the growing season later into Autumn?]. The trees tell us the 1960s drought was pretty significant. Even the relatively insensitive northern red oaks slowed their roll during the 1960s drought [Editor’s note: “slowed their roll” is technical speak for narrower rings]. Nearly 500 years of Summer moisture availability. 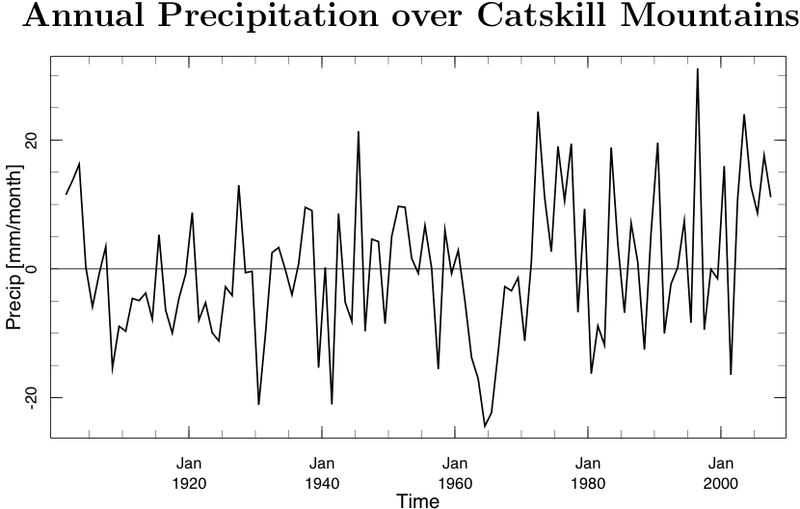 The 1960s drought is the red dagger on the right. Source for above here. Open access here. Equally as important, if not more importantly, what likely triggered these restrictions by the Commonwealth of Massachusetts, is that they learned – and remembered – that much of the stress of the 1960s drought was induced by overconsumption of water. Kudos to the Anthropogenic Hydrologic System of the Commonwealth of Massachusetts; the governing body managing Commonwealth-scale water. Institutionally, they have remembered and learned from their history and seem to be prepared for the dry summer that was forecast in the spring. Since the 1960s, water consumption in Massachusetts and many other states is significantly down despite being perceived as a well-watered region. Massachusetts is being proactive and applying a kind of Cautionary Principle – conserving just in case. To wrap up, you’ve no doubt seen pictures of reservoirs in the western US during the current megadrought. Massachusetts DCR Archives shared pictures from the 1960s at a workshop I attended. The images and others are strikingly similar and need to be seen. Scroll on. Above: New Croton Reservoir by Gordon W. Gahan. Taken on July 1, 1965. From the Harvard Art Museum.